If you follow me on Twitter, you may have seen my freak out over the Lac Attack Magical Musings collection. The Magical Musings collection is a collaboration between Anastasia of Lac Attack Nail Lacquer and Kirsten of Glitta Gloves. The collection was inspired by HARRY POTTER!!!! Being that I am the biggest HP nerd of all time, I bought the entire collection the minute it came out. Literally, it was release at 9 a.m., I had the whole thing in my cart at 9:01. Since it's so close to Christmas, I had to wear Lac Attack Holidays in Hogsmeade first! Hogsmeade, by the way, is the all-wizard village that the Hogwarts students visit on weekends. 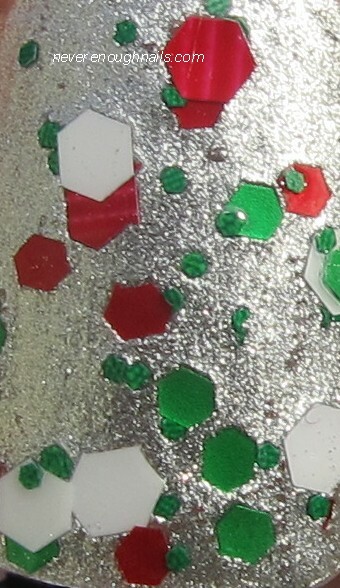 Holidays in Hogsmeade is an assortment of red, green and white hex glitters in various sizes in a clear base. I layered it over a silver foil to make all three colors pop. This is two coats of Holidays in Hogsmeade over L'Oreal Silver Star (an LE from years ago). It was pretty easy to apply, I did some dabbing to get a lot of glitter on my nails. I started out with regular wiped coats, but I did the second coat by dabbing. All of the large glitter pieces came out of the bottle easily and I didn't have to do any fishing for them. All in all, a lovely glitter for the holidays, even if you don't like Harry Potter. I am so glad Kirsten and Anastasia did a holiday polish in the MM collection. For me, Harry Potter and Christmas will always be connected. I got the first 3 HP books for Christmas years ago, and spent the rest of my school vacation memorizing them by heart reading them. The descriptions of Hogwarts at Christmas-time and the annual Christmas feast are also some of my favorite images from the books. I'm super happy to have a Harry Potter holiday polish in my collection, it makes me feel all warm and fuzzy inside. You know what else makes me feel warm and fuzzy? 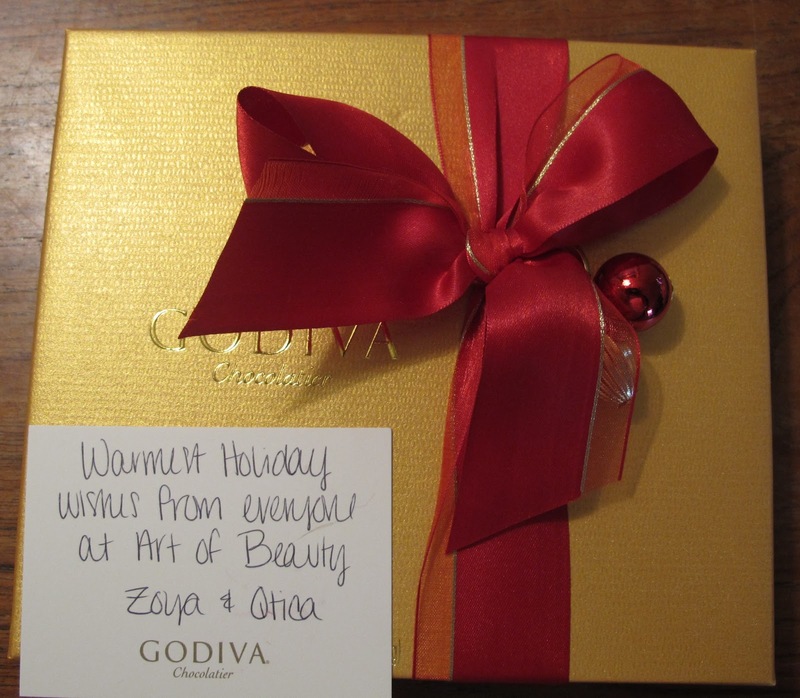 The fact the Zoya and Qtica sent me Godiva chocolates for Christmas! What sweethearts!!! Zoya must be an awesome company to work for, everyone there is so nice! Thanks Zoya! Some of the Lac Attack Magical Musings collection (including Holidays in Hogsmeade) is available now on the Lac Attack Goodsie shop. Anastasia has said that the collection will be around for awhile, so if the polishes you want are sold out, she'll restock again soon I'm sure!